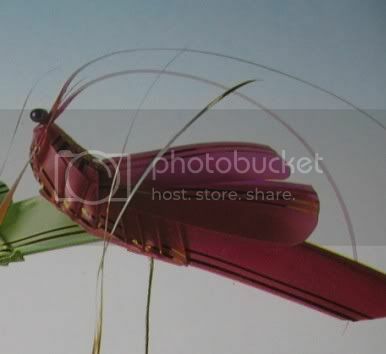 Does anyone know how to make grass grasshoppers? I've seen it in ''Find The Light'' when Bosco made one and gave it to Tavia. oh yes, I'd love to learn how to make them. They're really cute <333. Someone can help link us to a website with instructions, or anyone knows how to make one?? yeah..I do find those grasshopper cute and pretty. Someone taught me once, but it's been a while and i have forgotten...the process seems so complicated and hard. 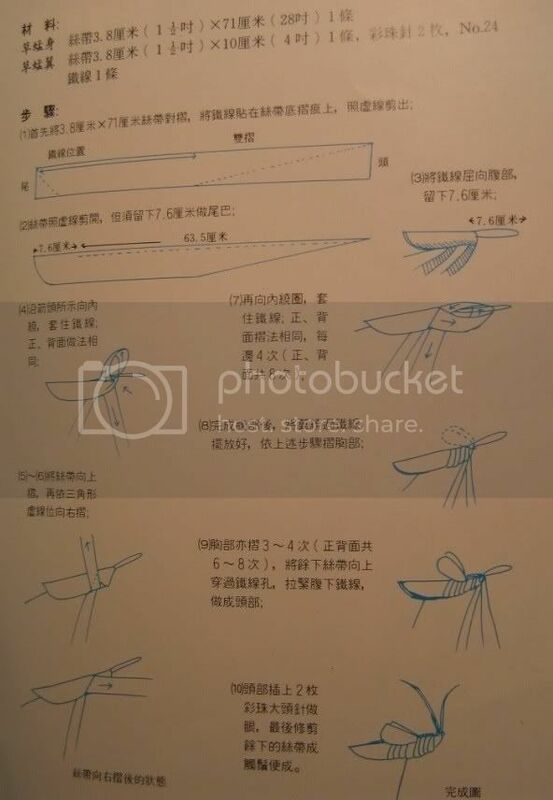 I have the instructions to make it, but can't read it....it would be nice if someone can translate it into english. 1. 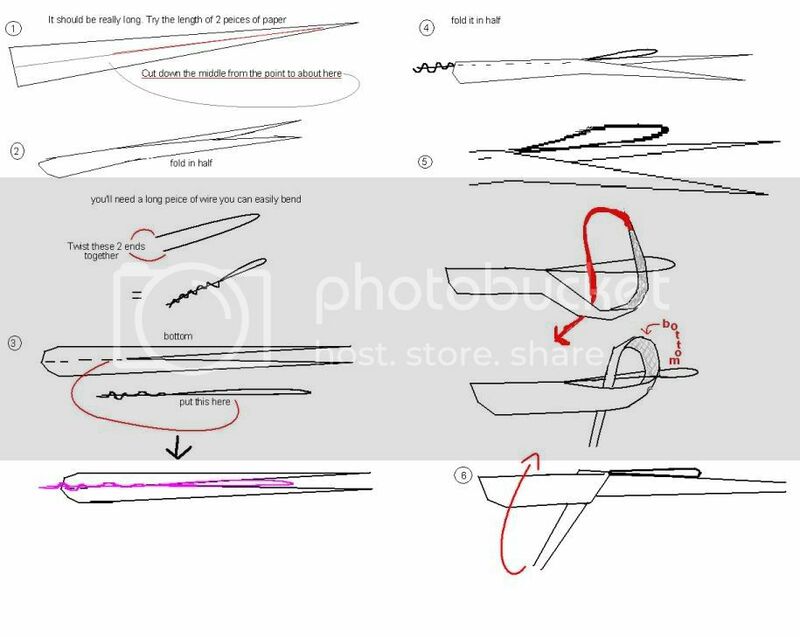 Something along the lines of folding the 1.5 x 28 inch ribbon in half (length wise) and placing the piece of wire along the fold - but only along where the solid double ended arrow is. Cut out the ribbon as shown in the image (along dotted lines). In Picture: the ribbon's left is its tail while the head is on the right. 2. Cut along the fold as shown by the dotted lines - that is, leaving 7.6cm uncut at the tail end. 4. Ok, this is where my translating's a bit limited...it says something like following the arrows' directions, wrap the ribbon around the wire. Do the same for front and back. 7. Bring the ribbon around the piece of wire and slip back through as shown by the arrows. Steps 5/6/7 are done to both front and back. 4 times each side, totalling 8 times. This is the lower part of the grasshopper. 8. 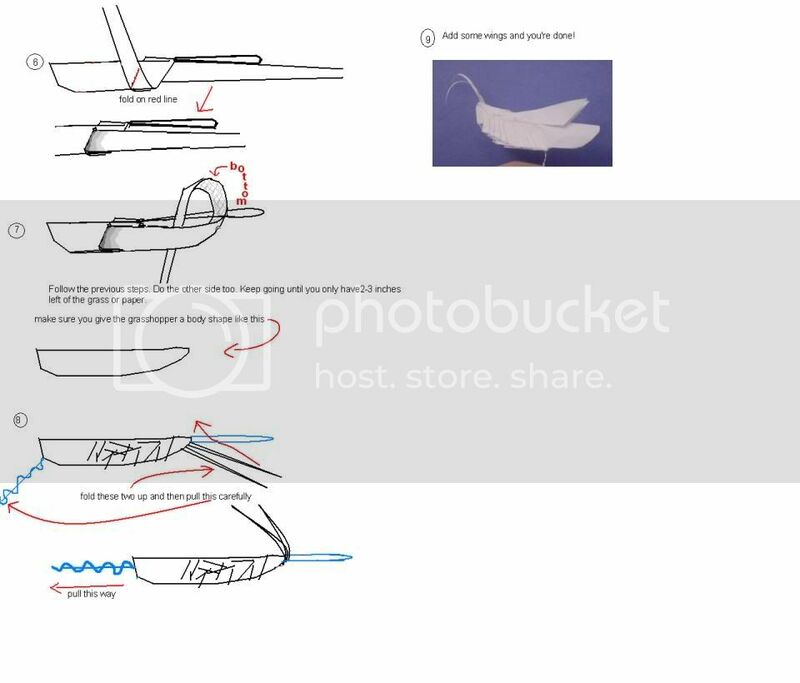 Grab the shorter piece of ribbon and position as shown in the picture to form the wings. 9. Continue doing as did in step 7...that is, continue the looping around the bare wire. Do this 3-4 times each side...totallying 6-8 times in total. After this, slip the excess ribbon through the wire loop and tug on the wire from below so that the loop tightens and forms the head. 10. You may wish to add two coloured pins into the head as eyes and then cut the excess ribbon to form two stalks. wow that seems extremely complicated... has anyone finished one? wow just like those ancient series where the guy makes it for the girl. So cool! thank you pk888 and lonilonei for tranlating it. imma try it! n maybe show a pic later on if it works out. I just attempted making one but i had to make it out of paper because i don't have any grass. Edited by darwin9090, 16 February 2006 - 07:38 PM. That's very good darwin9090, looks like the real thing. I think it is even harder to make with paper, since you were successful, i bet if you use ribbon or grass to make, it would look really pretty. WT....do we take the ribbion and then fold it in half? can someone put a step by step image! I'm really having diffculty! Edited by darwin9090, 22 May 2006 - 05:39 PM. No problem. Is it easy to follow? wahh.. very difficult to make... but practise makes perfect im sure i can do this soon..
wow thanks darwin9090 for making these instructions for us. i might try making them some day... it looks cute. Want to share it with the kids. In November, I will going there to see them as a volunteer work. Would be nice to able to share those thing with the kids. Someone here didn't share her 3D owl with me but I still didn't do it. oops... find it so hard. I wonder if this is much easier. I am going to show the kids, bamboo stick dance too. I really love to see the kids smile and enjoy it. So looking forwards to all the handcrafts here. Thank you so much for sharing. Hey guys, thank you so much for this, especially Darwin-that name suits you since you're so clever! You are a genius, making one and making such simple instructions. I'd been searching so long for instructions, and finally saw it. I really can't thank you people enough. pk888 thnks for posting the instructions, always wanted to do this n hvae been searching for some time. also darwin thanks so much with coming out with the simpler instructions. so much easier to understand. u r really good at it. thnks. I still can't figure out how to make it. o.O Even with the translated instructions, it still seems complicated. Does anyone know where to get simpler instructions? Thanks for the instructions! So complicated ~_~ lol not sure how to make it. i give up on making this.. i tried so many times and yet failed.. geez..
Wow, the ending result is pretty. The process to make that looks really difficult though! My brother-in-law taught me how to make it...it's pretty similar to the paper one, but probably less steps. haha.. i mananged to do the first steps.. but then i got confused in part 8 lol.. anyone help? WHOA! !..i totally have to try it...i like challenges..but hihi then i'm lazy..but i'm gonna learn how to make one f those grasshoppers! LOL .. i think it would be hard to find thick grass.. maybe i shouold try with paper too... ! cool, i`m so gonna try to make one of those. I made it once when i was a kid, it was pretty hard and i spent 4 hour in the park with my freinds making it. Once you finish it, the satisfaction is amazing. True...they are really cute!I love animal bracelet too.